Whenever we are in a different city around the world, we hit the streets to absorb the vibe, as well as to see what locals are wearing that might influence our own style choices. So, when we recently received an advance copy of this definitive history of the world’s most influential clothing trend from the people who wore it best...and we can’t put it down. 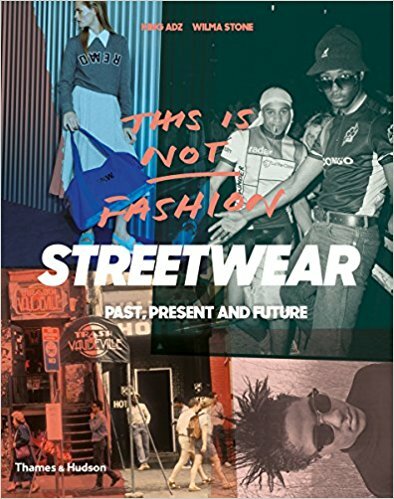 This Is Not Fashion: Streetwear Past, Present and Future (Thames & Hudson) by authors King ADZ and Wilma Stone. From a view to back in the day to seeing what the day after tomorrow night create, streetwear has never looked so cool. It shows the story of how streetwear begins in 1972 in Jersey City, the birthplace of Trash and Vaudeville, the first-ever streetwear shop. It then moves on to the start of punk, which was a decisive influence on what is considered streetwear today, and then to Ivy League preppies, the hip-hop kings and queens of Harlem, the dresser/casual movement born out of British soccer culture, the skater scene of California, and the Paninari scooter-brats of Milan. It continues to evolve under street-art influences and instant global communication in the Internet era. The book shares how a tradition of subcultural moments has been incorporated into a multibillion-dollar global industry, dominating from the street to the runway. Starting from the building blocks of repurposed sportswear, workwear, and combat-wear, they explain how a revolutionary sartorial trend has grown to encompass a vast range of disparate tribes, offering a powerful sense of identity to all. Whether focusing on such major brands as Stüssi, Carhartt, Tommy Hilfiger, and SHUT or today’s up-and-comers from South African townships or downtown Seoul, we dig that this volume provides an eye-opening survey of the scene. It also examines how the Internet has changed the ways streetwear in sold and consumed, and what may lie in the trend’s future.